Home Facebook internet 10 good reasons to leave Facebook account? As of June 30, 2016, Facebook claimed 1.13 billion active users . In other words, there is one chance out of six for you to be part of it. However, if for many years Facebook has brought more people coming from all over the globe, the social network created by Mark Zuckerberg also presents some major disadvantages. In particular regarding its policy and access to private data. What make the "Facebook haters" more and more numerous. Are you a part of it? 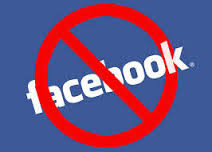 Here are 10 good reasons (more or less objective) to leave Facebook. In return for the use of the social network, the Internet user is exposed to the risks of disclosure of his private life. Indeed, the inscription on Facebook gives this social network the right to exploit all the data of the users for commercial purposes. 2. Some deleted data are ... retained! Facebook was pointed out after it was discovered that the company keeps the photos of Internet users they have deleted on a server. In addition, the closure of a Facebook account only takes effect after weeks. Facebook's policy of maintaining the buzz causes members to connect continuously in order to keep up with the news. Now, we are witnessing an addiction of Internet users accentuated by the presence of Facebook through mobile applications. Instead of bringing people closer, Facebook has helped to isolate them and keep them in a race to like, share and number of friends. The Facebook user is confronted with the vision of the social life of others who tend to demonstrate all the positive aspects. Pictures of parties too great, good food, dream holiday: we brush overdose. And in the face of this, some members actually sink into depression by finding their lives less interesting than those of others. Facebook allows perverts, pedophiles and other salivators to spy on the profiles of other users with impunity. Hence the importance of regularly checking its privacy options to find out who really has access to shared content. Today, sign-up on multiple sites requires a Facebook account. However, we know that Facebook is not totally protected against hackers. Which means that in case of piracy, all your accounts linked to this social network could be "exhibited". With the expansion of other social networks like Snapchat , Facebook has already lost tens of thousands of its members. Soon, your youngest friend will be a respectable father and not a young teenager who chains conquests. Sponsored posts, suggestions, pages of major brands ... On Facebook, the pub is ubiquitous, sometimes even without anyone realizing it. And this is perhaps the most vicious. That being said, Facebook is also a useful social network to keep in touch with friends and stay up to date. And then at Masculin.com, we are happy when we see our community grow ! Come on, do not leave right now!